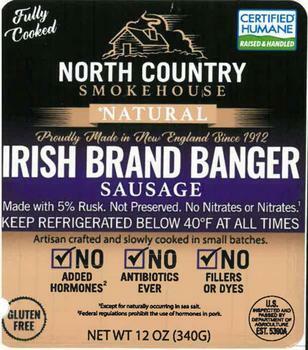 North Country Smokehouse of Claremont, N.H., is recalling approximately 9,000 pounds of pork sausage. Although the front of the label says the product is gluten free, it contains wheat. The recalled product, bearing establishment number “EST. 5390A” inside the USDA mark of inspection, was shipped to distribution and retail locations nationwide. Customers who purchased the recalled product should not consume it, but discard or return it to the place of purchase. Consumers with questions about the recall may contact Alicia Baker at (603) 543-0234 Ext.214.